In Memoriam: Dr. Martin Luther King, Jr.
Memoriam: Dr. Martin Luther_King, Jr.
Adolphus Cunningham Hailstork was born in Rochester, New York in 1941, but spent most of his childhood in Albany, where he joined the choir of the Episcopalian cathedral. From this experience he developed an interest in vocal melodic writing that asserts itself not only in his choral works and art songs. I liked the piano because I could sit and improvise for hours, and that's when I decided I preferred to improvise rather than to practice my scales and arpeggios. That's when I decided “Hey, maybe I better go on to Composition!” I love making up stuff! While attending Albany High School he began to conduct a boys' choral group and to compose music. Yes. I have a notebook here from '57 that has some early sketches for pieces in it. That's the earliest extant stuff I have! ... Mostly they were little piano pieces....The high school orchestra director, a wonderful woman named Gertrude Howarth, said “If you write it, we'll play it!”...Started in high school and have never stopped! ...That makes this the 53rd year I've been at this stuff; I'm finally getting it! Directing his attention to composition, Hailstork entered Howard University in 1959, where he studied with Mark Fax and Warner Lawson. He was 18 when he wrote Theory2a for an assignment, according to “Kaleidoscope: The Musical World of Adolphus Hailstork.” It also says he wrote the music for The Race for Space. (Laughs) Yes! A little musical! That was the second musical I did at Howard; I wrote two in a row. The current President of Wayne State University helped write the script!...His name is Irvin Reid. Dr. Hailstork subsequently attended the Manhattan School of Music, where he studied with Ludmila Uleha, Nicholas Flagello, Vittorio Giannini and David Diamond, according to The Harvard Biographical Dictionary of Music. “Kaleidoscope” observes that he composed Concert Invention in his first semester, completing the piece on December 19, 1963. Dr. Hailstork completed Phaedra on February 15, 1965. 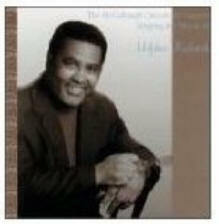 He received a Bachelor of Music degree in Composition in 1965 and a Master of Music degree in Composition in 1966. Statement, Variations and Fugue was his master's thesis and was performed by the Baltimore Symphony in 1966, according to the Presser website. Dr. Hailstork served in the U.S. Armed Forces in Germany from 1966-68. The interviewer asked what his musical activities were while he was in the military. I just wrote! I rented a piano, put it in the bachelor officers quarters, in my room, and wrote music!...I entered as a First Lieutenant because I had gotten time served in grade as a Second Lieutenant while I was working on my Master's. I left as a Captain. My time there was delightful! I was given the very pleasurable job of running the Officers Club! Upon his return to the U.S. In 1968, Adolphus Hailstork attended Michigan State University. The website of his publisher, Theodore Presser Co., indicates Dr. Hailstork began his teaching career as a graduate teaching assistant from 1969-1971 at M.S.U., where he obtained a Ph.D. in 1971. Hailstork's first faculty appointment was at Youngstown State University in Ohio. During this time, he attended the 1975 Black Music Symposium in Minneapolis, where Paul Freeman was conducting a series of events, including a reading session devoted to new works. One of these was Hailstork's Celebration!, a work commissioned by the J.C. Penney Foundation in anticipation of the American Bicentennial. It proved to be exceptional in all respects. Hailstork's 1979 Epitaph, by contrast, comes after a decade of reflection. Showing his distinctive mastery of orchestration and harmony, it is a work of transcendent beauty that conveys the nobility of its subject, and serves as a tribute of acceptance. Composed in memory of four little girls killed by a bomb explosion at the 16th Street Baptist Church, Birmingham, Alabama, during Sunday school class 15 September 1963. It's a piece written for wind ensemble that was written in about 1983. I just played it with the Georgia All-College Band this past weekend in Savannah, and all I have to say about the piece is "Wow. "...I've heard it said you don't listen to "American Guernica", you experience it, and after playing it, I'm inclined to agree. The Theodore Presser website says this piece won a national competition. Of this work, Dr. Hailstork has commented: "In this composition I have coupled Euro-American structural methods (Melodic counterpoint, extensive key changes, long range graduation, dramatic contrasts) with Afro-American idioms and processes (spirituals, chant-song, ostinato, rhythms, polymeters). It was a unique experience to watch the work come alive through his response. The work is in a ternary form: the initial presentation of melodic ideas is followed by a section that plays with their implications and a conclusion that serves as a reminder of the original materials. The great port of Norfolk, Virginia, where I live, was the direct inspiration. Hailstork's Symphony No. 1 was written for a summer music festival in Ocean Grove, New Jersey, where the composer conducted the first performance. A slightly shorter performance (21:10) has been recorded by the Virginia Symphony Orchestra, led by JoAnn Falletta, conductor, on Naxos 8.559722 (2012). Consort Piece (1995), commissioned by the Norfolk Chamber Ensemble, was awarded first prize by the University of Delaware Festival of Contemporary Music. This song, written in 1996, sets a text by Frederick Douglass. It was premiered with Adolphus Hailstork and Doug Chenault at the Unitarian Church of Norfolk, Va. Slave Song was written for and dedicated to Willis Patterson, Associate Dean, School of Music, University of Michigan. In the summer of 1996, I took a trip to Africa. There I visited the forts along the coast of Ghana, and saw the dungeons where the slaves were held before being shipped overseas. I put my reaction to that sad scene in movement two of this symphony. In movement four I sought to reflect the determination of a people who had arrived in America as slaves, but struggled, with courage and faith, against numerous odds. The goal in my Third Symphony was to write a piece that was lighter in approach than my second. 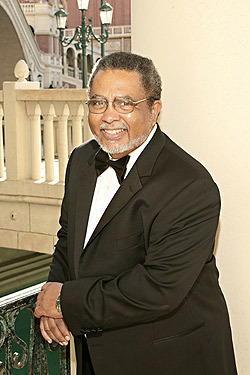 The opera's composer is Adolphus Hailstork, professor of composition at Norfolk State University. "When I discovered Dunbar's work, I realized that he was my artistic ancestor, because I write music that reflects a double cultural experience, that of my standard European-oriented education and that of my ethnic heritage." Hailstork blended the two influences in the opera, using standard harmonic and melodic styles for some pieces while choosing a musical style reflective of African-American blues and gospel in others. Set in 1878, Joshua's Boots is based on extensive research into the real "wild west," specifically the recently "re-discovered" historical importance of Black Cowboys and the all-black Buffalo Soldiers in the opening up of the country. The opera is a real Western, complete with saloon singers and dancers, cowpokes and cowboy songs and life on the long, lonely and dangerous cattle drive. They did not commit suicide; they were already dead – and they knew it. That was my first thought when I heard about the people who, when trapped on the upper floors of the World Trade Center on September the eleventh, two thousand and one, chose to leap to their death rather than to be incinerated in the two thousand degree inferno surrounding them. It was a final life choice. In this composition, actually a tone poem for flute, viola and harp, I wanted to reflect the thoughts of a person facing that gruesome choice. The leap into space is the final dance. Hailstork writes in a variety of forms and styles: duos for such combinations as horn and piano, clarinet and piano, flute and piano, and other symphonic works and tone poems for orchestra; a piano concerto; numerous chamber works; a large number of songs including songs for soprano, baritone, mezzo-soprano, some with piano and others with orchestra or chamber group; band works and band transcriptions, and many pieces for piano. In 2000, Prof. Hailstork assumed his present position at Old Dominion University, where he is an Eminent Scholar as well. In the interview he was asked what courses he teaches. One year I teach Orchestration; the other year I teach Counterpoint, and I have four Composition students. Prof. Hailstork said the Composition students each have one individual lesson a week, and his teaching schedule has been in place for 10 years. The composer was asked if he favored the organ. Yes! About ten years ago, I started taking organ lessons again with a colleague on Old Dominion's staff, and really realized that was the instrument I should have stayed with and that is more natural to me than the piano is, because of the sustained sounds and the kind of rich textures that you can get on the organ. The interviewer asked if Prof. Hailstork resumed organ lessons before recording his organ CD Amazing Grace. Yes, I did. In fact, the organist on Amazing Grace was the teacher I was studying with! The composer identified the organist as James Kosnik. He was asked if his return to the organ had been fruitful for him. Oh, yes it was! It was fruitful and satisfying! I made the arrangements in 2005 to help celebrate the reopening of the Crispus Attucks Theater in Norfolk, Virginia. Whitman's Journey, Launch Out on Endless Seas was commissioned by Donald J. McCullough for the Master Chorale of Washington, DC. The première took place in April 2006 at the Kennedy Center for the Performing Arts. The texts used in this piece are among the early, youthful poems in Whitman’s Leaves of Grass. They depict Whitman’s vigorous optimism and his call to all women and men to join with him as he launches out on life’s great journey. The Winton Woods High School Varsity Ensemble had the extraordinary opportunity to perform for noted composer Adolphus Hailstork at a workshop presented by the Cincinnati Chapter of the American Guild of Organists on Saturday, February 20. Dr. Hailstork is the leading, living African-American composer of classical music. I've been commissioned for choral and orchestra a lot over the past 10 years! It's still going on....A lot of colleagues of my age are instrumentally oriented, and I came up as a singer. So I was very vocally oriented, and song and lyricism and tonality are all important to me. The composer was invited to comment on his philosophy of composing. I can only talk about the characteristics that I have observed in my own work. It's always lyrical, tonal, narrative, dramatic, and propulsive. I just wanted to add to the repertoire. I didn't switch over to the school of thought that came into being in the Sixties of reinventing music. Because a lot of it just didn't sing for me. Prof. Hailstork was asked: "Do you have any thoughts on the crisis facing Music in public education?" It's a shame that so many Music programs have been cut out of public education. I'm glad that it was available for me when I came along, because that's where I really got my start! I went in the public school system, singing in the public school choirs and playing in the public school orchestras. That's where it all began for me, along with my excellent exposure in an Episcopal Cathedral. Those two things had a big impact! This is one person whose whole life started with public school Music! 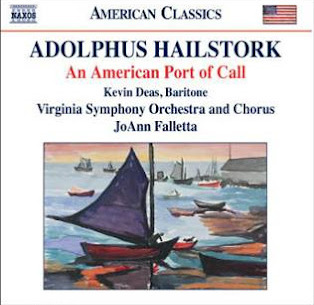 Adolphus Hailstork: An American Port of Call; Naxos 8.559722 (2012), was recorded live. The Virginia Symphony was led by JoAnn Falletta and was joined by the Virginia Symphony Chorus and baritone, Kevin Deas for performances of five works by Hailstork: his Symphony No. 1, Three Spirituals, An American Port of Call, Fanfare on Amazing Grace and Whitman’s Journey, Part One: Launch Out on Endless Seas. 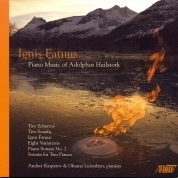 Adolphus Hailstork: Ignis Fatuus; Andrey Kasparov, piano; Oksana Lutsyshyn, piano; Invencia Piano Duo; Albany 1112 (2009). Scherzos (2) for Piano; Trio Sonata; Ignis Fatuus; Variations (8) Shalom Chaverim; Sonata for Piano No. 2; Sonata for 2 Pianos. Legacy: Works for Bassoon by African-American Composers; Bassoon Set; Lecolion Washington, bassoon; Mark Ensley, piano; Troy 1038 (2008). Great European Organs Vol 72: Gaston Gilbert Litaize, Herbert Sumsion, Henk Temmingh, Wijnand Van Klaveren, August Gottfried Ritter, Anthon van der Horst, Alec Rowley, Adolphus Hailstork, Samuel Rousseau; Prelude and Toccata for Organ on "Veni Emmanuel": Toccata; Herman Jordaan, organ; Priory Records 863 (2008). 2007 Midwest Clinic; New Wade'n Water; Austin Symphonic Band; Mark Records 7322 (2008). 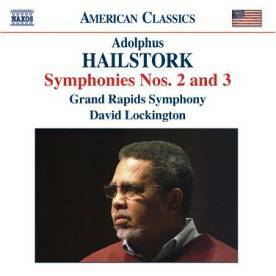 Adolphus Hailstork: Symphonies Nos. 2 and 3; American Classics, Naxos 8.559295 (2007). David Lockington conducts the Grand Rapids Symphony. Symphony No. 3, I. Vivace (12:00); II. Moderato (12:04); III. Scherzo (04:45); IV. Finale: Moderato (11:55). Symphony No. 2, I. Allegro (8:00); II. Grave (10:59); III. Allegro con brio (04:43); IV. Adagio - Allegro (13:05). 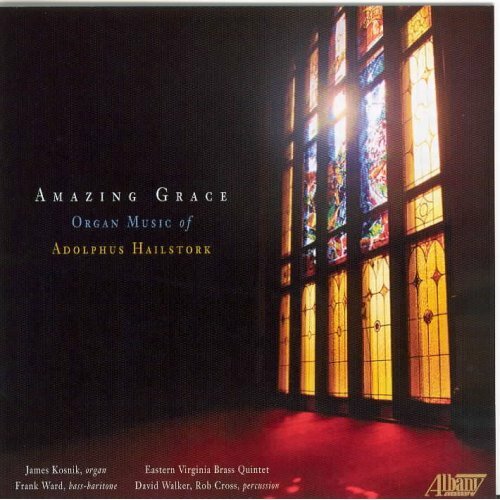 Amazing Grace: Organ Music of Adolphus Hailstork; Fanfare on Amazing Grace; Everytime I Feel The Spirit; There is a Balm In Gilead; Wade in the Water; Go Down Moses; Oh Freedom; Eastern Virginia Brass quintet; Rob Cross, timpani; James Kosnik, organ; Frank Ward, bass-baritone; Troy 873 (2006). 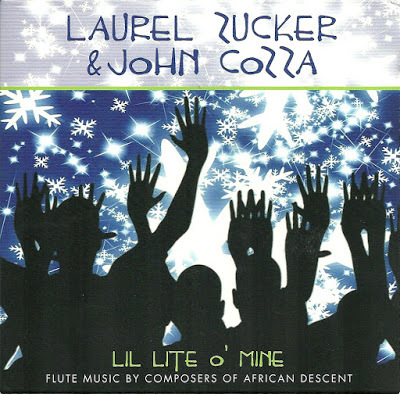 Lil' Lite O' Mine; The Pied Piper of Harlem; Harold Jones, flute; Collette Valentine, piano; Leonarda 355 (2005). 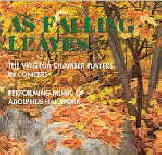 As Falling Leaves: Music by Adolphus Hailstork; Debra Cross, flute; Beverly Baker, viola; Barbara Chapman, harp; Charles Woodward, piano; Robert Cross, percussion; Vahn Armstrong, violin; Amanda Gates-Armstrong, violin; Jennifer Snyder, viola; Michael Daniels, cello; Troy 612 (2004). 1. Sanctum 2. Arabesques 3. String Quartet No. 1 4. Two Romances for Viola & Chamber Ensemble. Dance Like The Wind: Music of Today's Black Composers; Nocturne; Maria Jette, soprano; VocalEssence Ensemble; Philip Brunelle, conductor; Clarion 906 (2004). 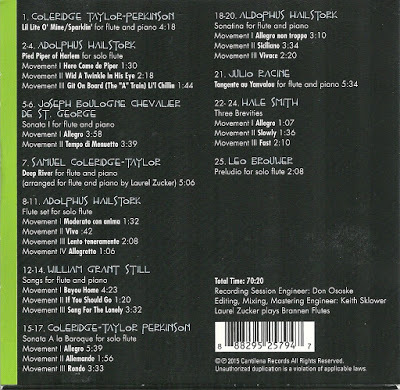 Rodney Mack: Spirit of the Trumpeter; Variations for Trumpet; Rodney Mack, trumpet; Karen Walwyn, piano; Troy 552 (2003). Celebration! 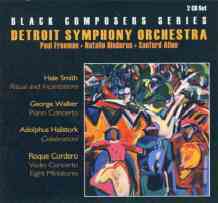 (3:16), Black Composers Series, Sony Music Custom Marketing Group DSO-1111 (2002). Paul Freeman conducted the Detroit Symphony Orchestra in a 1976 recording of Celebration! as part of the historic CBS Black Composers Series. The recording has been reissued on CD by Sony. The liner notes are by Professor Dominique-René de Lerma: “Celebration!, commissioned by J.C. Penney in anticipation of the American Bicentennial, was premiered by Paul Freeman and the Minnesota Orchestra at the 1975 Black Music Symposium in Minneapolis. The composer wrote at the time: 'Celebration! Is tonal, straightforward, energetic, and positive – all of the things I consider necessary to project the spirit of a festive occasion.'" Epitaph for a Man who Dreamed - In Memoriam: Dr. Martin Luther King, Jr. (7:37) and An American Port of Call (8:32); African Heritage Symphonic Series, Vol. II; Cedille 90000 061 (2002). 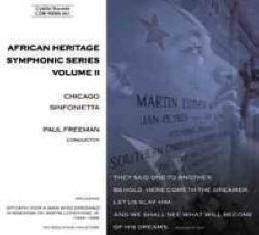 Both works were recorded by the Chicago Sinfonietta under the direction of Paul Freeman, Conductor. Orff – Carmina Burana: Works By Schubert, Rheinberger, Billings, Byrd, Schumann, Mozart, Hailstork, Hogan and Erb; Choirs of The College of William & Mary; James Armstrong, Jr., Director (2001). This double CD featured selections from concerts and performances of 1996-1998. Lo, There Is Light! ; Song of Deborah for soprano, alto, chorus and organ; Nancy B. Granert, organ; Murray Forbes Somerville, conductor; Pro Organo (2001). I Will Lift Up Mine Eyes: A Celebration Of The Music Of Adolphus Hailstork; Baltimore Symphony Orchestra; Daniel Hege, conductor; Morgan State University Choir; Baltimore Symphony HAIL-001 (2000). 1. Intrada (1:46) 2. Done Made My Vow (45:16); Janice Chandler, soprano; Gregory Hopkins, tenor; Darrien Cofield, boy soprano; Dr. Harold A. Carter, Sr., speaker 3. An American Fanfare (3:55) 4. I Will Lift Up Mine Eyes (3:26); Thomas Young, tenor; Dr. Nathan Carter, conductor 5. How Long? (10:13) 6. The Lord is My Shepherd (5:56). Sence You Went Away: Contemporary African American Art Songs & Spirituals; Slave Song; Alvy Powell, bass-baritone; Byron Burford, piano; Troy 387 (2000). Dark Fires: 20th Century Music for Piano; Piano Sonata No. 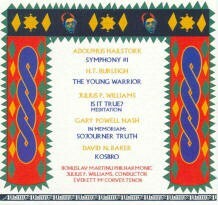 1; Karen Walwyn, piano; Troy 266 (1997). Albany Records explains: “The significance of this four-volume recording project is its celebration of 20th century compositions for piano and some Chamber works written by Americans of African descent that have never been recorded or have had limited recorded performance. The contributions of the American composer of African descent to classical music is rarely addressed, and as a result, this music remains virtually unknown." 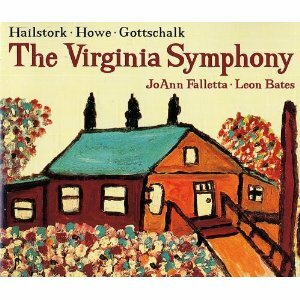 The Virginia Symphony: Hailstork, Howe, Gottschalk; 1. Epitaph (In Memoriam: Martin Luther King, Jr.); 2. Piano Concerto: Moderato 3. Piano Concerto: Adagio 4. Piano Concerto: Lento - Vivace 5. Celebration! ; JoAnn Falletta, conductor; Leon Bates, piano; Music & The Arts (1997). 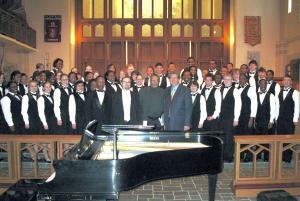 The McCullough Chorale In Concert Singing the Music of Adolphus Hailstork; 1. Spiritual Songs 2. Songs of Life and Love 3. Setting from the Song of Solomon 4. The Lamb 5. Seven Songs of the Rubaiyat 6. A Carol For All Children. Donald McCullough, conductor; Troy 156 (1995). Symphony No. 1 (23:10), Symphonic Brotherhood, Troy 104 (1993). Julius P. Williams, Conductor, leads the Bohuslav Martinu Philharmonic. An American Port of Call: Music of Adolphus Hailstork; 1. An American Port of Call (8:21) ; Rundfunk-Sinfonie Orchestra 2. Epitaph (7:30); Ljubljani 3. Piano Sonata No. 1 (28:00); Raymond Jackson 4. Piano Trio (19:44); Nova Trio; Adolphus Hailstork (1993).